McNary rolled on Thursday, Jan. 18, defeating McKay 51-12 and West Salem 55-15. But the Celtics couldn’t carry that momentum over to senior night, falling to North Salem 42-30 on Friday, Jan. 19. Senior Brayden Ebbs (170) opened Friday’s home dual, his final at McNary, with a pin in the first period. After North Salem won the next two matches by major decision and pin fall to go ahead 10-6, senior Blake Norton (220) earned a pin in the second period to put the Celtics on top 12-10. But North Salem won the next four matches, including a forfeit at 106 pounds, to grab the lead and never let it go. At 126 pounds, McNary junior Enrique Vincent pinned his opponent in 30 seconds. Senior Jerry Martinez then earned a pin in the second period at 132 pounds. The Celtics final six points came on a forfeit at 145 pounds. Senior Josiah Christensen led his match 2-0 at 152 pounds before getting pinned in the second period. The Celtics lost two matches, 285 and 138, by 3-0 and 4-3 decisions. Grady Burrows (106) and Tony Castaneda (113) were out with injuries. “We’ve got people who could make us a little bit tougher but I’m very happy to have the lineup we had with us tonight based on everything we’re dealing with,” coach Ebbs said. 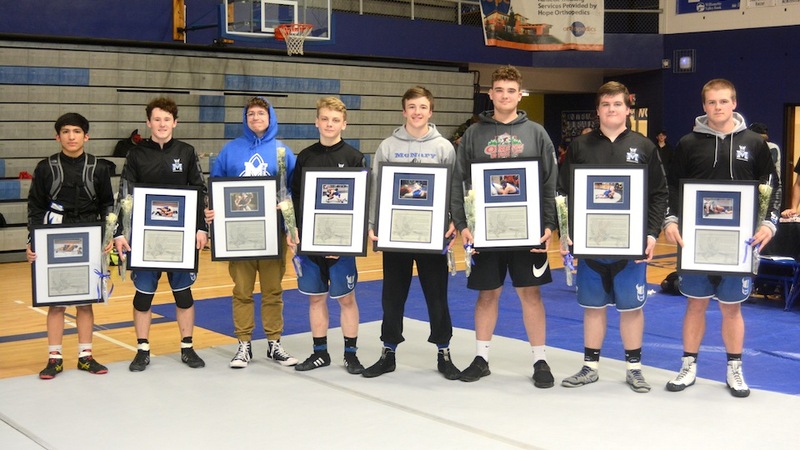 McNary honored all eight of its seniors before the dual: Ebbs, Martinez, Norton, Christensen, Joe Collins, Noah Grunberg, Alex Harrison and Isaiah Putnam. The Celtics earned five pins against McKay on Thursday: Vincent (126), Castaneda (106), Norton (220), Randal Nordberg (182)and Garrett Wampler (170). Martinez won by a 16-6 major decision and Grunberg added a 15-0 technical fall. McNary won four matches by points. Christensen won 12-7 at 152 pounds and Ebbs edged his opponent 6-4 at 160. Collins earned a 3-2 victory at 285 and Rigoberto Hernandez won 13-9 at 113. Wampler, Norton, Hernandez and Jaydin Gomez all had pins against West Salem. Grunberg won a 16-4 major decision. Martinez and Nick Hernandez each won by one point, 7-6 and 9-8. Castaneda added a 10-3 victory in the rout. The Celtics travel to West Albany on Thursday, Jan. 25 for their final league dual of the season. The district meet is Feb. 2-3 at McKay. McNary junior Abbie Hawley made a shot at the buzzer as the Lady Celts defeated Greater Valley Conferce rival South Salem 39-38 on Tuesday, Jan. 16. Hawley led McNary with 13 points and four rebounds. Senior Kailey Doutt added 11 points and seven rebounds in the victory. The Lady Celts hadn’t defeated South Salem since assistant coach Deven Hunter’s senior year (2012). 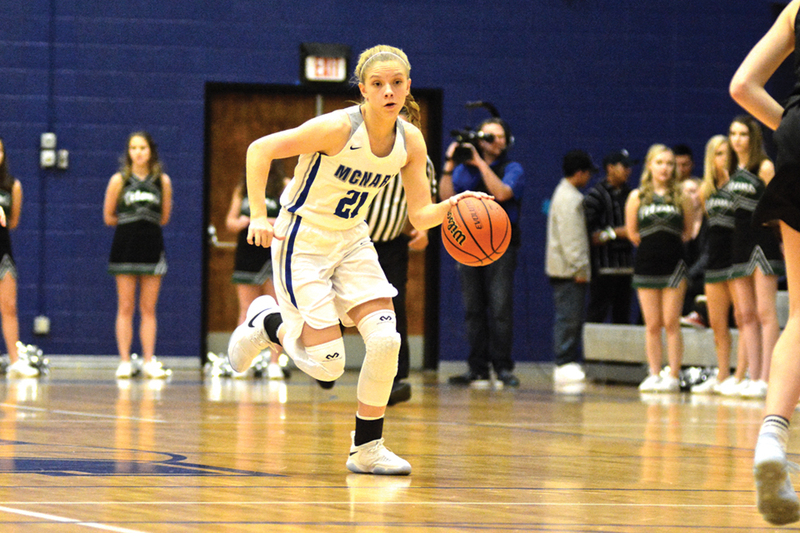 McNary rebounded from a 58-39 loss at McMinnville on Friday, Jan. 12. Doutt had 21 points and nine rebounds. Hawley and Paige Downer each added seven points. Sabella Alfaro scored the only four other points in the road loss. The Lady Celts, 11-4 overall and 5-2 in league play, are back in action on Tuesday, Jan. 23 at home against North Salem at 6:45 p.m.